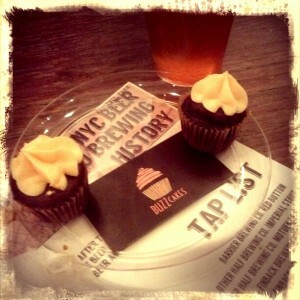 After studying the tap list of local offerings, I started with the Other Half Imperial Stout—a rich, malty, hoppy little number that went well with the chocolate cupcake I’d snagged. Liz’s first selection, Finback’s Double Sess(ion) Wit, was refreshing and spiked with peppercorns and chamomile. The room was starting to buzz with beer talk as more people arrived, and we wound up sharing our table with an interesting older lady named Arlene who happened to be the mother-in-law of one of the panelists. Every time I got up to grab us more beer, I’d return to find my sister and Arlene getting tipsy and giggling like schoolgirls. My sister tried my my Peekskill Sour (a beer brewed with brettanomyces) and instantly registered a expression: “It’s like a cider married a beer and had a baby!” She quickly ate a chunk of jalapeño cheddar pretzel and went back to her Other Half Motueka Pale, leaving me and my gueze-y sour alone. After everyone was sufficiently beer-ed up, the panelists took their seats. It felt a tad like a college lecture setup, only with really awesome beer in lieu of crappy bodega coffee. Beerded Ladies founder Meredith Heil was in charge of directing the discussion with the likes of Urban Oyster’s Dave Nacycz, Sam Richardson (the brewer and co-owner of Other Half Brewing), Ben Wiley of Bar Great Harry, and beer writer Joshua M. Bernstein. 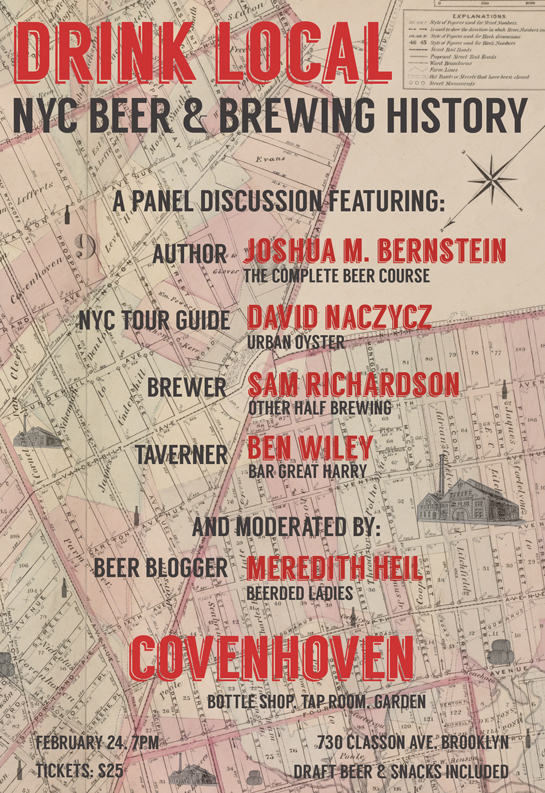 What interested me is that as much as the conversation was supposed to be about history and our brewing past, every panelist found a segue to bring up our brewing present. The beer gardens of yore had been meeting grounds for families and communities, not frat boys and raucous sport fans. Places like Covenhoven or, in my hood, Astoria Bier & Cheese, offer a mellower, more community-driven vibe—no TVs, no booze, just craft beer, artisanal snacks, and a place to gather. 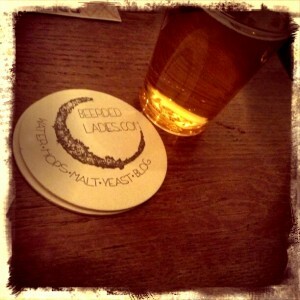 “People drank local beer 200 years ago because they had to” Ben pointed out. “The local brewery [provided the] freshest and best beer…having a brewery in your neighborhood is good.” I have to agree that having a brewery in my neighborhood is pretty rad. Since opening a little over a year ago, Singlecut has really become an important part of Astoria’s community identity—not just with their beer, but with the local events and classes they host in their taproom. These days we can choose to support our local breweries and enjoy their brews; you could even do an Urban Oyster tour and get to try beer in the breweries! 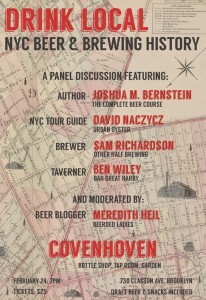 In the New York of old, most beer produced and consumed was low in alcohol, a trend we are starting to pick back up on. Sure, as Dave aptly described, “Reintroduction of ales and all the flavor they are capable of is part of the craft beer movement,” but, like the 11 percent Other Half stout I began my evening with, the alcohol content can be problematic. “Extending your ability to carry on a conversation for two hours [after drinking several craft ales] is kind of tough,” Josh pointed out, which is why we are noticing resurgence in production of lager and session beers. I was taking my first sip of Barrier’s Red Button ale during this discussion, which clocks in at 8.8 percent a.b.v. and it sure tastes like booze—with hints of cannabis. An overwhelming dank smell, not unheard of in beer as hops and ganja are, in fact, related. A few more high a.b.v. beers and this wench might be on the floor, forget taking notes and meeting people. Meredith asked the guys for their closing thoughts and, each in their own way, they echoed Dave’s sentiment that “There has never been a better time for beer in New York.” Even though the geek in me wanted more history, the beer-loving rest of me was feeling exhilarated. I asked my sister and her new gal pal what they took from the panel discussion, and both answered me with one word: community. Funny that water, grain, and yeast can generate something as simple and profound as human connection.